This entry was posted in Campus Announcement and tagged eagle statues, Samford Park, Toomer's Corner on August 22, 2014 by Wire Eagle. 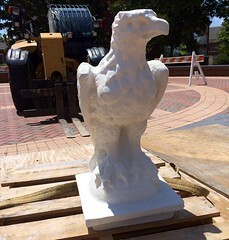 AUBURN UNIVERSITY – Capping a five-month renovation of Samford Park at Toomer’s Corner, workers today placed two stone eagles atop the gates marking the entrance to Auburn University. The eagles are replicas of the two marble statues that adorned the gates for more than 50 years. The original statues were displayed inside Samford Hall this summer, away from the elements that have taken their toll over the years. This entry was posted in Campus Announcement and tagged College of Veterinary Medicine on August 21, 2014 by Wire Eagle. AUBURN UNIVERSITY – Auburn University’s internationally recognized detector dog program, operating since 2009 as Animal Health and Performance in the College of Veterinary Medicine, has been renamed Canine Performance Sciences.